He was my grandmother’s Uncle Ray, the younger brother of her father. My mother and my sisters and I called him Unkie. While I was thinking about writing this post, it dawned on me – with some surprise – that I actually knew someone born in 1891. Not knew of him, but knew him. And I’m thankful that I did. Born in Batavia Illinois, Unkie was christened Karl John Raymond Tolf. Karl for his paternal grandfather and John for his maternal grandfather. Why Raymond I wonder? Isn’t it interesting that that’s the given name he chose to use? And why wasn’t Harry, Peter and Augusta’s oldest son named to honor their fathers? Why did they save those names for Unkie? Unkie was the catalyst for my family history research. 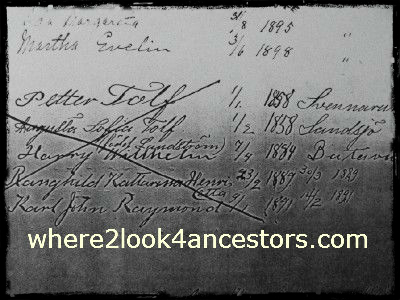 Many of the records in his file were gathered when I was a newbie genealogist. Let’s just say, his collection isn’t pretty. As part of my genealogy organizing project, I had reviewed and scanned all the documents in Unkie’s folder. Why I wondered, didn’t I ever follow up on the 2003 response I received from the Illinois State Archives? I had requested a copy of Unkie’s World War I draft record (pre-Ancestry.com subscription). They wrote to say they couldn’t locate the item I requested, but instead sent a copy of “the index card with his bonus number. However we were unsuccessful in finding his bonus application.” Say what? Oh, I think there’s a little research in my future! My 2015 research goal for Unkie is to learn more about his bonus application. My 2015 organizational goal for Unkie is to bring all of his documentation from out-of-date to up-to-date on Ancestry, Dropbox, Family Tree Maker, and in his paper files. Did Harry Tolf mellow with age?